Government supporters are demanding justice for the “198 victims of coup plotting terrorism,” who were killed in the context of violent anti-government protests. Sept 20 (teleSUR) Thousands of government supporters marched in the streets of Managua Wednesday to show their support for Nicaraguan President Daniel Ortega and demand justice for the “198 victims of coup plotting terrorism,” who were killed in the context of violent anti-government protests. Demonstrators carried banners with the slogan “we walk for peace, justice, and life,” red and black Sandinista flags, and the national flag of Nicaragua. The 6-kilometer march ended with popular music and dance. The pro-government demonstration was organized two days after opposition forces protested, demanding “justice and freedom” in the country. While opposition groups accused the president of being responsible for suppressing street protests that led to hundreds of deaths, Ortega, in a recent interview with EFE, rejected state repression allegations and reiterated the United States government and drug trafficking networks were financing and arming opposition groups. According to Nicaragua’s Commission for Truth Peace and Justice, 270 people died and over 2,100 were injured during the protests. In previous Sandinista demonstrations, Ortega criticized the U.N. for siding with the powerful and not recognizing the government supporters who were killed, tortured, and beaten during the protests. The Nicaraguan political crisis began in mid-April when protesters took to the streets against a proposed social security reform that sought to overcome the system’s financial crisis by increasing contributions from both employees and employers to avoid raising the retirement age. President Ortega withdrew the reform and issued calls for dialogue to avoid a spiral of violence, but the protesters’ demands shifted towards getting Ortega to step down before his term ends in 2021, a request the government has rejected. This shift in the protesters’ demands raised concerns over their true intentions. 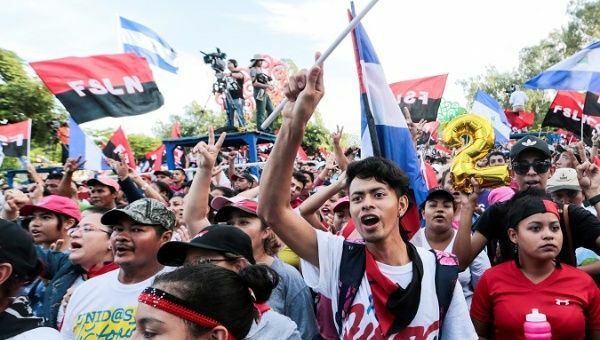 Earlier this month, President Ortega warned that Nicaragua is under threat by the U.S. “We are under threat. We can’t rule out anything out as far as the U.S. is concerned. We can’t rule out a military intervention,” Ortega told France 24 TV.